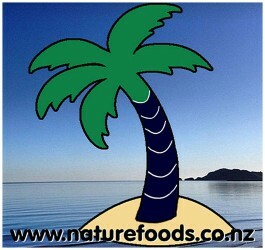 Raw Planet Cacao Powder (250gm) from Peru is New Zealand's first raw cacao powder that's been organically certified. As the market has grown, the Peruvian producer has been able to invest in new machinery and more people. Because of this, he's just perfected a technique that makes truly raw organic cacao powder. This means that you can now create the world's healthiest organic raw chocolate treats easier and cheaper than before. It's created by cold-pressing the cacao beans into a cake separating the oil from the protein and fibre. The temperature is never allowed to exceed 47 degrees Celsius and is usually 40 degrees Celsius (all other cocoa powders are exposed to temperatures as high as 150 degrees Celcius). A high-accuracy thermometer monitors the process. Slowly, the pure, liquid cacao butter begins to sift off down a stainless steel valve. The remaining dry 'cake-like' material is then cold-ground, fine-milled and sifted so that only the finest, most bio-available raw cacao particles filter through into the finished product. This allows for maximum digestion and antioxidant absorption. It has a delightful, full, antioxidant-rich chocolate flavour. This unique technique uses absolutely no chemicals, no hexane, no solvents. ORAC antioxidant laboratory analysis confirms that there are over 25,200 ORAC units in a single spoonful of Raw Cacao Powder! This delicious, easy-to-use and mega-potent (955 ORAC units per gram) form of chocolate has broken a world record. Never before has there been 25,200 ORAC units of antioxidant power in a spoonful of anything. Dark chocolate has been touted as a source of antioxidants, but this raw cacao powder is way beyond that. * Italian researchers found eating 100 grams of dark chocolate each day for 15 days lowered blood pressure in the 15-person study. The University of L'Aquila team also found the body's ability to metabolise sugar -- a problem for people with diabetes - was improved. Because the effect was believed to be due to antioxidant levels, with Raw Cacao Powder we can likely multiply this effect. * Dutch researchers indicate that dark chocolate contains four times the amount of catechin antioxidants than black tea, which is suspected of having a protective effect against heart disease and possibly cancer due to its antioxidant properties. With Raw Cacao Powder, it would be 28 times more than Black Tea and potentially 7 times the protection! 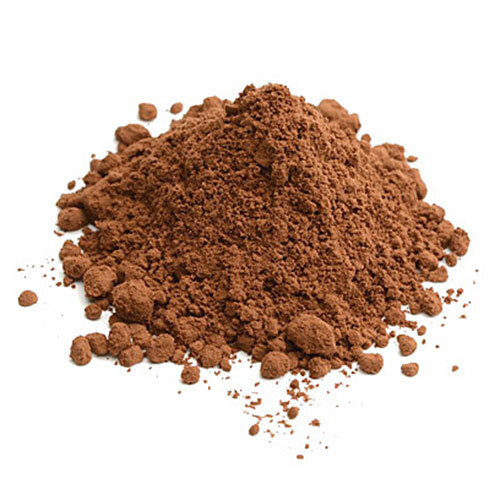 Raw cacao powder contains about seven times as many antioxidants as cooked cacao powder, that's about 723% more! * The amino acid Tryptophan is found naturally in cacao. Tryptophan enhances relaxation and promotes better sleep. Now you'll get at least 33% more when you use Raw Cacao Powder! * Researchers have discovered that phenylethylamine (PEA) has a positive effect in enhancing feelings of love. And Chocolate has been proven to be an excellent source of PEA. 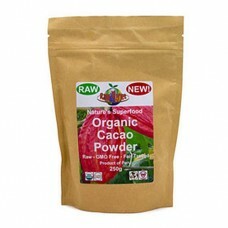 Now you can love at least 33% more with Raw Cacao Powder! * Cacao is the richest food source of magnesium of any common food. Magnesium is the number one mineral that assists and supports healthy heart functioning. Now you get at least 33% more magnesium gram-per-gram with Raw Cacao Powder! * Raw Cacao Powder has at least 33% more Arginine, the aphrodisiac-like amino acid believed by body builders to build muscle and aid in recovery. * Add it to your favorite smoothies (one heaping tablespoon will do) and watch them instantly become Raw Chocolate masterpieces! * You can make any cookie, brownie or pie more chocolatey and delicious - just add a tablespoon or more to taste. * You can blend it with sweet almond milk. This gives you a creamy dark chocolate milk that's LOADED with antioxidant power and tastes out of this world! Please refrigerate or store in a cool, dry place (out of direct sunlight) if you can, though it's not essential. This product is microbe-free and highly-stable.